Proud. Accomplished. Healthy. Happy. Tired. Relieved. Changed. Overwhelmed. Surreal. Weird. Sad. These are some of the things I’ve been feeling since I completed my PCT thru-hike on Sept. 27. Life on the PCT was, for the most part, simple and drama-free. I’d wake up, break down camp, eat, hike, get to the next water source, eat, hike some more, eat, set up camp, sleep and then repeat it all again the next day. There would be steep climbs up and down. There was no shortage of incredible views. I walked through meadows and densely forested areas. I crossed rivers and creeks, sometimes on a bridge, sometimes fording with my feet. I climbed over blown down trees. I hiked over rocks. I walked through mud. I bushwhacked my way through overgrown brush. I swam in alpine lakes. I made friends with lots of other hikers. I ate a ridiculous amount of gummi bears, wild blueberries, instant mashed potatoes and Top Ramen. I never got sick of watching the sunrise and sunset from the trail. I hiked. I laughed. I cried. I fell. I rolled my ankle. I got dirty. I went days without having a shower or using a flush toilet. I conquered fears, some I never even knew I had. I learned a lot about myself. I re-evaluated my life priorities. I fell in love with both myself and the trail. I had my life forever changed. The PCT has taught me many lessons over the last five months. I learned that my feet can take me anywhere I want to go if I tell them to. With every fear I faced, I learned how to tap into my personal power and in the process, realized I really could do anything I put my mind to. I learned how to let go of things and be happy living with less. I fell in love with living out of my pack. I learned how to appreciate the simple things. Simple things in normal life like garbage cans, pit toilets with toilet paper, picnic tables and running water became day makers out on trail. I also learned there are plenty of good people out there who want to help other people through the incredible amounts of human generosity I experienced in the form of trail magic provided by trail angels I met along the way. What a lot of people don’t realize about thru-hiking the PCT is it’s less of a hike and more of a lifestyle. 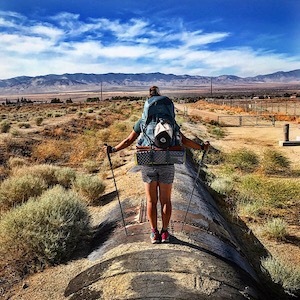 You either love thru-hiking or you don’t and you usually know within the first 100 miles. Hiking is only one part of the PCT. Thru-hiking the PCT is about adapting to a nomadic lifestyle where you rarely sleep in the same place twice. Weather and water sources dictate how you spend your days on trail. There’s no worry about running off to the next appointment or trying to get to work on time. You eat, hike, eat, sleep and repeat. There’s plenty of time to take pictures, build relationships with other hikers, take breaks when you’re tired, eat when you’re hungry and smell the wildflowers. There’s always something new to see and no one day is ever the same. Thru-hiking the PCT has given me permission to dream big. Never again will I be able to settle for average or just okay. The trail has proved to me that nothing is impossible. I can manifest whatever I want like creating the job of my dreams, being paid to write about hiking the PCT, having people come listen to me talk about hiking the PCT and even doing another thru-hike in 2019. The PCT has taken over my life and my mind. It’s all I think about and talk about – the experiences I had hiking it last year, the sections I missed, the sections I can’t wait to see again, the people I met along the way and my plans to hike it again this year. Thru-hiking the PCT has ruined my life in so many ways and all of them in the best ways possible. My life will never be the same. I would love to intercept your 2019 hike, with cold root beer! Good luck, and happy adventures!